The fine craft and reliability of a custom knife will see your through a lifetime of hard service. Read more. Built one at a time, to be strong and functional. See complete price list. Also offering knife repair, restoration and handle conversions. Read more. A quick tour of my little corner, of my little world. Offering a complete line of fixed blade, full tang, handmade custom cutlery. Built one at a time, to be strong and functional, and with reasonable care, will last a lifetime of hard use. 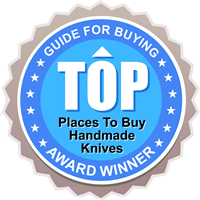 With over 50 handcrafted models to choose from, I can meet all your knife needs. For both fresh, and saltwater sportsman, including a Bird & Trout model. Many styles for the big, and small game hunter. Plus camper, and utility models, for the backpacker, camper, and avid outdoorsman. Many models to choose from, including gut-hooks, and caping knives. From big, to realy big Bowies, plus tantos, boot, Persion styles, and combat fighters. Mean short spears, and spear heads, to exceptional wicked, hog hunter knives. Quillion style daggers, native American war tomahawks, and executive desk letter openers. Cutlery sets, personal steak knives, chef's sandwich knife, and even a meat cleaver. For the avid backyard Barbecue Chef, a 5 or 9 piece, BBQ Knife Set. All knives with a brass, S.S. or N.S bolster, come with a lightly engraved scroll pattern. Hand sewn, and custom fitted, leather knife sheaths, and belt pouches, for folding knives. All handcrafted from tough, thick, Water Buffalo hide leather. Offered in both vertical carry models, and the fantastic concealed carry, or horizontal, cross-draw, carry method. For the large, or heavy knife, or short sword, I handcraft an Adjustable leather, Shoulder Harness carry system. Also offers, for fixed blade knives, a knife repair, restoration, and handle conversion, service. This Web site will acquaint you with the many varieties of blades I offer, the color and grain pattern of the exotic hard woods and horns I use for handles, and the different styles of my custom sheaths. What an extraordinary piece! I’m very pleased and quite confident it will be put to good use for many generations. It really is a mountain man’s blade! Jay, thanks so much for the beautiful job you did on the Bowie my grandfather left me. Wherever he is, I’m sure he appreciates it too! Got the knife last night and we are so happy with how it turned out! It looks even better than I had imagined and feels great in the hand. Superb craftsmanship! My mother is very pleased and my family is looking forward to passing it down to the next generations. If I ever need other fixed blade work or know anybody that does, I’ll be sure to send them your way. Thanks so much for knocking this out of the park for me!